Description: Hamden Rd., 0859 hours. 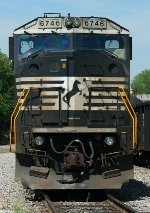 Description: NS 22A tied down with an EMD leader. Description: Southbound NS 301, meeting 32Q at Taylorville, IL. Description: NS Southbound Freight Train 385 passing through 43rd Street in Birmingham, Al. 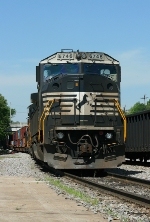 Description: NS Southbound Freight Train 385 ( Birmingham to Mobile, Al. ) passing through 43rd Street in Birmingham, Al. Description: SD 60I NS 6746 hasto be moved so H88 can pick up the cars behind it. Description: NS 20K with D9-40CWs 9413 and 9092 along with SD60I 6746. Description: A westbound trailer with with SD60I 6746 and D9-40CWs 9092 & 9413. Description: Behind the VFW, 1044 hours. Description: Behind the VFW, 1044 hours. Lots of birds. Description: Part of a WB light engine move. Description: Morning eastbound mixed freight.